I do not believe that people should have to pay for access to information that allows them to understand their health. For this reason, MastAttack blog posts, consults, questions answered via chat or correspondence, and the upcoming Spring 2018 course is free for everyone who would like access to my knowledge. People often ask if they can pay me for my time or assistance. For the reasons stated above, I have never charged anyone. After a lot of thought, given the amount of time and energy I dedicate to MastAttack, I have decided that if you would like to send me some money, and are in a position to do so, that I will allow that for the first time. No one needs to pay me. Paying me does not get you any additional attention or favor. I am committed to providing a space where money does not impact the quality of information people receive about their health. However, I have some major direct and indirect health related expenses coming up so if anyone would like to express their gratitude by sending me some money, that would be lovely. If not, that is perfectly fine, too. Really. I just set up a YouCaring account here and a Venmo account under Lisa Klimas. Money can be sent that way. Please note that MastAttack is NOT a non profit and that any money you send is a gift, not a donation. Thanks! My long term goal for MastAttack has always been to teach mast cell patients everything they needed to know about mast cell disease to advocate for themselves effectively and to help others. This week, I was able to share that goal with my fellow MastAttackers. 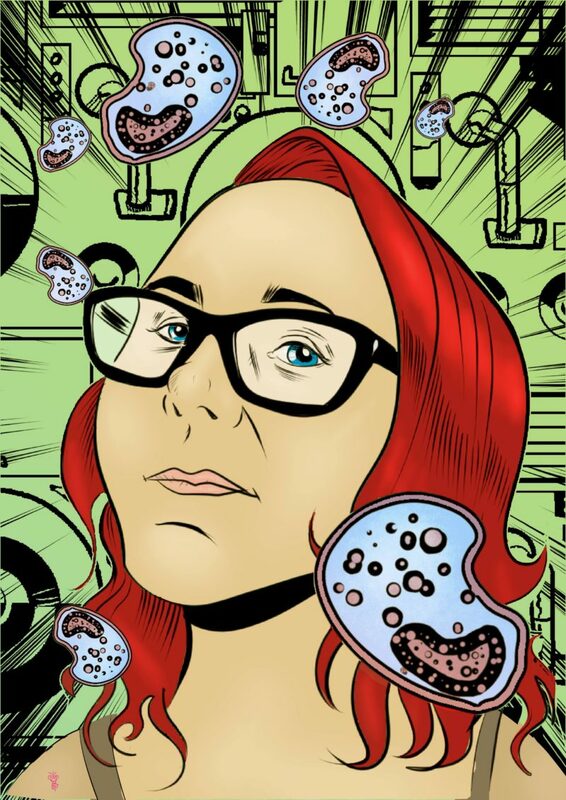 I am really humbled by the outpouring of support from my readers and the mast cell community. I cannot believe that I get to do this and I’m so glad I will be doing it with you guys. You keep me focused and help me fight on the hard days. I have gotten a lot of questions regarding the logistics of MastAttack U so I figured I would answer them here. This spring, I will be teaching an eight week course called Introduction to Mast Cell Biology in Health and Disease (MAU101). I do not yet have firm dates for the course but I expect it run for April and May. The purpose of this course is to teach material that allows a person with basic understanding of mast cell disease to build upon the knowledge. I will teach intermediate concepts specific to mast cell biology while also teaching the general biology necessary to understand it. For example, when I talk about the CKIT D816V mutation, I will first give a short explanation of what mutation means, how mutations happen, and why exactly mutations can affect the way cells function. Students will build an understanding of general biology in addition to specific mast cell concepts. Every week, I will post a video in which I teach material by lecturing. The video will be posted on the blog and will be publicly available. I expect them to be 20-25 minutes long. Videos will be captioned and transcripts will be available when the video is posted. Once the video is posted, it will stay up indefinitely. You do not have to watch the video on the same day it is posted. You will be able to watch it at any time that is convenient for you. I received a question about whether or not it is okay to translate my course materials and lectures into other languages for non-English speaking mast cell communities. This is fine as long as they are used for educational purposes and people are not charged for the materials. The class format will basically be that I post a video on a specified day of the week every week for eight weeks in a row. Let’s say I post a new video every Tuesday. (Just picking a random day for this conversation.) The following Monday, we will discuss the contents of the video in a group discussion in the MastAttack Facebook group. People will be able to ask questions about the content at that time. I will have a list of prepared questions about that topic for us to discuss at that time as well. Each of the eight lectures for this first course stands alone. This means that you do not have to watch all eight in order (or at all) and participate in all eight discussions. If you want to watch the first and second video, then aren’t interested in watching any more until the sixth video, that’s fine. You do not need to have seen the preceding lectures to benefit. All group discussions will be locked at the end of the discussion period but will still be available for anyone wanting to read it. This course is designed to be inherently flexible because we as a patient group need flexibility. The purpose here is to learn in a safe environment, not to add more stress and responsibility to our plates. This course is open to every single person who is interested, whether they have a connection to mast cell disease or not. You do not have to have a science background. I will try my very best to make the science accessible to laypeople. I would like to know the names of everyone taking the course for my own edification but if you’d rather not tell me, that’s okay, too. You do not need special permission to access the videos or additional course materials, all of which will be on the website. If 800 people want to watch the videos every week and come to the discussion, everyone is welcome. With a lot of people, I expect there will be some hiccups as we figure out the best way for us to all communicate, but I’m sure we can sort it out. I will be relying on the help of a few admins and the good nature of students to keep things manageable. I have the good fortune to know a lot of people who know a great deal about mast cells. For people with high level understanding, I will be running a Master class, probably in the fall. This course will be very different from MAU101 and enrollment will likely be restricted. This is because in order to ensure that students are learning difficult concepts, there must be assignments and I must review them carefully. I have a general idea of what I want the course to look like but will wait to share until I have more concrete plans. I mentioned that my initial dream was to teach five people everything I know about mast cell disease. This is still my dream and my intention. I have not chosen anyone yet to mentor and will not for a few months, at least. If you are interested in being mentored by me, you are welcome to contact me and let me know. If you are not in the first group of mentees, please do not give up. The point of this transfer of knowledge is that the people I mentor will be responsible for mentoring another group of people. There will be plenty of opportunities for people to learn from me in this way. Again, once I have more concrete plans, I will let everyone know. In the meantime, if you think you might like to be mentored by me, take the MAU101 course and see how you like it. A number of people have reached out to ask if they can compensate me for the course. I have decided that if people are able to and want to, that I will accept money from people to help offset some of my health care costs. I need to set up a mechanism for this and will tell people when I know exactly how to do that. I do not have plans currently to incorporate MastAttack as a nonprofit for a few reasons (although I do plan to establish it as a legal entity). It is important for people to realize that any money contributed is not a donation and therefore not tax deductible. It would instead essentially be paying me for a service. Please keep in mind that no one is obligated in any way to pay for this course. Many of us have astronomical expenses or would prefer not to pay for other reasons. This is perfectly fine. It will not affect your standing with me. Seriously. I am so wicked excited that this dream has finally evolved into something tangible. It has been in the works for a long time and there were times when I was sure I would never get it done. I appreciate the kind words and support I have received since announcing the plans for MastAttack U. I don’t know how I got so lucky that I get to do this. I cannot wait to build a legion of mast cell patients who know their disease inside and out. I’m leaving in the morning for my annual Girls’ weekend with my sister, cousins and friends, so I will be out of touch for a few days. Hope everyone has a swell and reaction free weekend! MCAS is a serious, debilitating disease that directly causes an array of symptoms that often interfere with the daily living activities of patients who have it. MCAS increases the risk of anaphylaxis, a potentially fatal, severe allergic reaction. MCAS patients require careful management of their condition to stay healthy and safe. Overwhelmingly, this requires medication. There is nothing wrong with needing medical management of MCAS. You are not doing anything wrong by taking medications prescribed by a knowledgeable provider. MCAS patients are more likely to have other disabling conditions, such as gastroparesis, Ehlers Danlos Syndrome, Postural Orthostatic Tachycardia Syndrome, and various autoimmune disorders and immunodeficiencies, among others. Patients with MCAS sometimes need an extraordinary level of nutritional intervention to prevent malnutrition, starvation, and complications thereof. Patients with MCAS sometimes require central intravenous lines to facilitate nutrition, use of IV fluids, and IV medications. Patients with MCAS sometimes require GI tubes to facilitate nutrition and medication use in patients who are not able to take foods and medications orally. Patients with MCAS often live complicated, stressful lives. Their experiences do not deserve to be mocked or minimized. They should under no circumstances attempt to manage their disease on their own without medical supervision without detailed conversations with their own care teams. Patients with MCAS often repeatedly suffer the indignity of having their very state of health questioned and belittled by providers, family members, coworkers, and the public. This is especially an issue where it concerns medically complex children as unfamiliar providers may incorrectly assume that these children are receiving unnecessary medical interventions, sometimes resulting in removing the child. All of these situations can discourage MCAS patients from seeking care and can endanger them. The idea that MCAS patients cannot die of complications of their mast cell disease and other diagnoses is ridiculous. I know MCAS patients who have died from anaphylaxis or from the inability to receive needed therapies without anaphylaxis and shock. We are fortunate as a community that these deaths are rare, but to insinuate that they do not happen is both incorrect and disrespectful. The recent “controversy” about whether or not MCAS can be serious and disabling is shocking and has been difficult to watch. I do not often find myself truly stunned. While many patients are fortunate to be able to live safely while managing MCAS, we all know a number of MCAS patients who are not able to achieve stability, and who require aggressive medical and surgical management to stay alive. I cannot believe I have to say this. MCAS patients are an integral part of the mast cell community. Please support them now. 62. Is it possible to become tolerant of a trigger again? Desensitization is the term for when your body becomes tolerant of something that it previously reacted to. While it usually means becoming tolerant of a medication, it is a general term so many mast cell patients use “desensitization” to mean becoming tolerant of anything they used to react to, including food or environmental triggers. Traditionally, desensitizing is done by exposing the body to a small amount of a trigger, then a little more at a later time, and so on until the body accepts a reasonable amount. In the regular allergies, in the US, “allergy shots” are used for this. A patient is injected with a tiny amount of an allergen repeatedly until their immune system stays calm when exposed to the trigger. There are some newer approaches for desensitization that use certain newer medications. In particular, anti-IgE therapy has been very well described for helping to force a patient to tolerate a trigger. Antihistamines and/or corticosteroids can be used to control the level of allergic response. In some instances, a rapid desensitization procedure can be used to force tolerance. These procedures are performed in a medical setting and may provide tolerance in a matter of days. They are usually used in situations where the benefit of a drug to which the patient reacts outweighs the risk of anaphylaxis, such as patients who need to use a specific chemotherapy drug to treat an aggressive disease. Importantly, if a patient becomes desensitized to a substance, they must be regularly exposed to that substance in order to continue tolerating it. Sometimes, a patient must be exposed daily in order to not react to the trigger. This is very patient and substance specific. Mast cell patients are different from typical allergy patients in a lot of ways, many of which we don’t understand. Patients ask from time to time if “allergy shots” or something similar will help them. Mast cell patients who have an IgE allergy to a substance may get some benefit from allergy shots. Specifically, allergy shots are recommended for mastocytosis patients who have allergies to certain insect stings. But what if they don’t have an IgE allergy? Will gradually increasing the amount of trigger in a series of exposures allow the body to accept it? I know plenty of mast cell patients who have used allergy shots or oral immunotherapy to improve trigger tolerance. I can’t think of any reason why this wouldn’t help if you could safely increase the exposures. For mast cell patients, the issue is that reactions can be so serious that desensitization is difficult to achieve. Patients can sometimes overcome this by using IV Benadryl, IV steroids, or a continuous IV epinephrine infusion. Mast cell patients should never attempt to force tolerance to any trigger without receiving advice from a health care provider that understands their specific health situation. Food allergies are widely recognized as being different from other kinds of allergies. We are learning about food allergies in real time right now. Food allergies are on the rise and now affect huge numbers of people around the world. This means that there’s tons of research on it, which is great. But it means that we still don’t understand them that well. For this reason, desensitization to food is trickier. There are a few methods commonly used in mast cell patients to manage food reactions. Sometimes a gradually increasing amount of trigger is eaten while the patient is monitored and given medications to manage any reactions, essentially a rapid desensitization for food. I find this approach is taken more commonly with children, largely because it is the recommended procedure for reintroducing triggers to children with FPIES. Sometimes people find that when they are exposed to a trigger for the first time in a while, they tolerate it until a second exposure. In these scenarios, rotation diets can be helpful. Allergy shots or oral immunotherapy for substances found in food are sometimes given. Results vary. I have talked a lot before about the fact that mast cell reactions are often the cumulative result of things that activate your mast cells. This means that if you do something that activates your mast cells before eating a trigger, your reaction may be worse. In some instances, you may only react if you do something irritating to your mast cells shortly before eating it. This doesn’t just happen to mast cell patients. There are many mentions in literature of allergy patients who only experience anaphylaxis to trigger foods if they have exercised shortly before eating. This means that if you are able to control the experience of eating triggers, you may have better success. You may do better if you refrain from doing anything irritating to mast cells like exercising, getting too hot, or being in a stressful situation. Food temperature can play a role. Many patients react to foods that are too hot or too cold. How you time medications can help. If you eat in the window of time when your medications are most active, you might find that a trigger is less activating. Solids are harder to digest and cause more histamine release than liquids (even thick liquids) so what form your food takes can matter, too. Additionally, if you are able to control your disease and inflammation, you may find yourself more tolerant of triggers overall. Patients who find that their symptoms are better controlled should discuss trials with their health care providers to see if they can try exposures to previous triggers. I can tell you that I have personally had a lot of success with using an anti-IgE medication to help me regain foods I lost. I have one IgE food allergy (chicken egg whites) and have no plans to ever try to consume them without thorough cooking (I’m tolerant of well cooked egg whites.) However, I do have a spectacular amount of food triggers that cause reactions ranging in severity from flushing to anaphylactic shock. My severe food reactions largely resolved when I started anti-IgE injections a few months ago. I eat all kinds of things I used to react badly to. I can eat cookies. I can eat cherry pie. I can eat bread. I try not to push my luck with things that have are loaded in histamine. I will never try alcohol or anything fermented again. Prior to taking the anti-IgE medication, I had some success with rotation diets in which I ate gradually increasing amounts of a trigger every four days. It didn’t really make the reactions stop but it did make them less severe, enough that I could reintroduce small amounts of some previous triggers into my diet. This happened after I had GI surgery that decreased my overall level of inflammation and mast cell reactivity. I have some news to share. I hadn’t planned to announce it until September but it has been a rough few days as a community and I thought sharing something positive might be helpful. A couple of years ago, I made a list of the goals I wanted to achieve through MastAttack. The most ambitious of those goals was to teach five other people everything I know about mast cell disease. The idea was that I would mentor and teach these people with the understanding that they would become responsible for teaching a certain number of people everything they had learned from me. In this way, my knowledge would be redundant and information much more readily accessible for patients and providers. The point was to nurture and protect an open flow of knowledge that increases as more people learn about these diseases in depth. So I had this idea and I spent several months turning it over and over in my mind. I knew it would take up a lot of my time and mental capacity. To be worth the huge time investment, it had to be effective. I had to figure out exactly what I knew that and how to teach that to other people, especially people who do not have a strong science background. I needed people to already have some basic understanding of mast cell disease in order to be able to teach the more technical points. I also had to figure out how to do it without it stressing me out and jeopardizing my health. Along those lines, I have been working on a secret project for over a year. I organized all the information that I felt a person had to understand to learn everything I knew. I divided it into sections and developed a syllabus for three university style courses on mast cell disease and mast cell biology. The first of these courses will start in the spring of 2018. It will teach intermediate topics beyond the basics of diagnosis/treatment/activation biology. It will run for 8 weeks. I will post a 20-25 minute video lecture on YouTube on a specified topic. The following week, we will meet online to discuss specific questions or issues associated with the topic. These discussions will happen in the MastAttack Facebook group, to which I will be returning later this year. I will also provide some handout style materials. I’m sure the first run of this course will have some growing pains and we can see what works and what doesn’t for subsequent teaching activities. I also wrote an introductory text specifically to give a knowledge base for students to build upon in this course. You are all currently reading that introductory text. It is the MastAttack 107 series. The most amazing part of MastAttack is seeing people who knew nothing about mast cell disease grow in their knowledge of these complicated concepts. For people who have a very solid understanding of mast cell disease and want to learn much more detailed, technical concepts, I plan to offer a Master class. I do not yet know the format this will take. I will let you all know when I’ve developed the idea further. I strongly believe that people should not have to pay for access to information that allows them to understand their health. For this reason, this course will be free. Lectures and materials will be publicly available. Given how much time and effort it has taken to put this all together, I am open to the idea of compensation if people want to and are able to. However, this will not affect your access to this course or the information taught in it, or your personal standing with me. No one will have to pay. I mean it. The last few days have been hard for a lot of people. The reason for this is largely because we rely on specific people to educate others on our behalves. The solution to this specific issue is to learn how to educate others ourselves. This will never replace the need for the support of well informed providers and researchers, but it will help people to regain some agency in their own care. The best possible situation for our community is a legion of well informed patients that can advocate for themselves and help others. The best possible scenario is for me to be obsolete. This is the MastAttack end game, and has been from the beginning. So now you all know my big secret. I’m really excited to do this. I hope you guys are, too. Never give up hope. Stand up and fight. One of the more arcane pieces of Lisa Klimas trivia is that I lost the majority of my hearing in 2009. I grew up hearing to hearing parents and am culturally hearing. I knew some sign language but it was pretty minimal. While I was losing my hearing, I focused all my available energy on learning ASL. I practiced for hours every day. I fingerspelled all day long and sang along to songs in ASL when I was driving or in the shower. My boyfriend at the time learned to sign as well and we signed at home. After eight years of being Deaf, I straddle the worlds of the hearing and Deaf cultures. ASL has become a part of me. I no longer have to consciously translate from English. I can think in ASL. Sometimes the words that my brain generates in response to something are signs instead of English words. When this happens, it is often a word or concept that has no direct translation in English. Some ideas are just more natively ASL. My post yesterday was written in response to a recent video that really downplays mast cell activation syndrome. I felt like the wind had been knocked out of me when I watched it. I had an immediate visceral reaction. My inner voice was signing to me. A flat palm brought up to the mouth and blowing gently across it. There are a lot of translations for this sign, none of which perfectly capture the meaning. It is close to nothing left or non-existent. Like you had something in your hand but now it is gone. I thought a lot today about why exactly this interview upset me so much and what my motivations were for speaking about it publicly. I think it’s because as a community we are so small and hidden. We really can’t afford bad press or harmful misinformation. Most people will never know about mast cell disease. Many will never even hear those words at all. Our stories will never reach everyone. But we try anyway. We try even when we know that our words will be swallowed by the cacophony of billions of voices talking over us. We shout as loud as we can that this is our story. That we exist. That we are falling through the holes in a health care system that isn’t prepared for us. That this is real and that we are scared and that we need help. We are a tiny community, a fraction of a fraction of a percent of the people living in this world. A fraction of a fraction whose faces and voices and stories are at great risk every day of never been known. A fraction of a fraction that lives with the knowledge that at any time, this disease could take everything. That any story they tell might be their last. That they might leave this world and become a story. That there will be nothing left of them. That they will cease to exist. I started this blog in 2014 with the expectation that only a few people would read it. There were some educational posts but they were pretty cursory. They were very directed towards patients without a lot of science background. I sometimes included references. I didn’t fret over the wording or the way I presented facts because controversy seemed unlikely to strike. I was basically talking to myself in those early months. Everyone who reads MastAttack knows where this ends up: that a lot of people started reading it. People came to me in droves for answers to their questions. Caregivers came for advice. Health care providers and researchers began to view me as an opinion leader and MastAttack as a reliable source of information about mast cell disease. I started working with patients and medical teams to advocate for appropriate management, diagnosis and treatment. I wrote and rewrote posts and read and reread literature and data about mast cell disease to guarantee its accuracy. I became an authority on mast cell disease and sort of authority figure in the mast cell community. I spend a massive amount of time researching mast cell disease. I write and rewrite posts constantly. I read and reread literature and data. The pressure to be right is huge, and it should be. MastAttack is a readily available point of contact for any person trying to learn about mast cell biology or mast cell disease. Failing to accurately vet something could affect people’s lives. Ultimately, I have to be right, every time, because when I speak, I am speaking for every mast cell patient. I take that responsibility very, very seriously. It is more than just understanding the science. I have to know the story I am trying to tell about these diseases that can direct patients and providers toward effective care. I have to convey the human impact of these diseases. As a representative of the mast cell community, I have to be on message. I have philosophical and academic differences with mast cell researchers, providers, and patients, especially about some of the more nuanced science. Despite this fact, overwhelmingly, this community is united in telling one story with one message. Mast cell disease is cruel and debilitating. It steals things from you. It steals your life. It is scary and graphic and gross and endless. It is handfuls of pills and organ damage and surgeries and central lines. It is so, so serious. It is epipens and swelling and wheezing and puke. It is danger. It is the exhaustion of arguing with insurance companies for hours at a time. It is the metal taste of fear when we wonder if our kids will get it. It is the quiet terror that this disease will get worse. It is the unutterable thought that maybe one day it will kill us. It is also the strength of a patient’s bonds with their family. It is the discovery that you can keep going long after you are certain that you can’t. It is iron will. It is the exhilaration of achievement in spite of the damage your body sustains on a daily basis. It is love and joy and tears and uncertainty. Because this is real life and these are real people and real diseases. That is the message. Misrepresenting that message in private or in public does more than a disservice to mast cell patients. It can be harmful. It can be dangerous. And since rare diseases are by their very nature scarce, media around them is also limited. A person without these diseases might only ever read one article about mast cell disease or see one interview. We do not have infinite opportunities to educate people about these diseases. We are not living in forever. When a person speaks to the public on behalf of the mast cell community, what they say MUST be correct. It MUST tell the real story. It MUST represent the experience of living with this disease accurately. It MUST be on message. For patients who are wondering why I’m waxing philosophical at 3am about the onus upon subject matter experts in this community, there was a very recent televised interview about mast cell activation syndrome (MCAS). I’m sincerely trying not to be unkind but I was genuinely bewildered by the amount of inaccuracy jammed into a four minute video. I’m not going to link to it because frankly, I don’t want to generate additional traffic to the video. It was insulting and irresponsible at best. Mast cell activation syndrome (MCAS) is a serious, chronic health condition that affects all organ systems. It increases the risk of anaphylaxis, which can be fatal. Complications of MCAS can include organ damage. It is often disabling. It is often found alongside other conditions such as Ehlers Danlos Syndrome and POTS. It is not well known among medical providers. It is difficult to test for. Treatment revolves around blocking mast cell mediators with things like antihistamines and mast cell stabilizers. Most people are not able to manage their diseases simply by avoiding triggers. Most people need medication, and often, a lot of it. Most people have symptoms every day and sometimes experience bad mast cell attacks and anaphylaxis. MCAS is in no way a mild or minor health issue. It should not be minimized and neither should the experiences of the people living with it. In the same way that experts are responsible for sharing accurate information, patients also have a duty. This is your community. You have a voice and a duty to use it. If you are not being represented accurately, raise hell. If your disease is being minimized, raise hell. If the science is not being explained correctly, raise hell. When misinformation threatens your safety, You. Raise. Hell. Yes, you. Use your voice. Tell your story. Stand up and fight. And raise hell. 60. Is anaphylaxis the same as anaphylactic shock? No. Anaphylaxis can result in anaphylactic shock but it often doesn’t. When talking about anaphylactic shock, people are referring to circulatory shock that was caused by anaphylaxis. Circulatory shock occurs when there is not enough blood to carry oxygen to all the tissues that need it. When the tissues don’t get enough oxygen, your organs stop working correctly. Circulatory shock is usually caused by low blood pressure. Anaphylaxis commonly causes low blood pressure and that can cause shock. However, anaphylaxis does not always cause low blood pressure, and it does not always cause shock. 61. If a tryptase level over 10.9 ng/mL is high, why is one of the criteria for systemic mastocytosis a tryptase level of 20.0 ng/mL or higher? Tryptase level is used in two ways in assessing mast cell patients: as a marker for activation, and as a marker for how many mast cells are in the body. There are two primary methods of using tryptase to indicate mast cell activation. The first way is to compare a tryptase level when a patient is reacting to a tryptase level when they are not reacting (baseline). Mast cells release more tryptase when they are activated. For mast cell patients, an increase of 20% + 2 ng/mL is considered evidence of mast cell activation. So if a patient has a baseline tryptase of 5 ng/mL when they are not reacting, anything 8 ng/mL (20% of 5 ng/mL is 1 ng/mL, then add 2 ng/mL = 8 ng/mL) or higher is considered evidence of activation. The second way is to count anything over 10.9 ng/mL as evidence of activation. When you are using tryptase as a measure of how many mast cells are in the body, the patient should not be reacting beyond their normal day to day symptoms. This is because you don’t want an increase in tryptase from activation to make the baseline level look higher than it is. Tryptase is used to measure how many mast cells are present because mast cells release some tryptase all the time, even when they aren’t activated. Anything over 10.9 ng/mL is considered an elevation of tryptase. The reason that 20 ng/mL is the cutoff for the SM criterion is that patients are likely to have a positive bone marrow biopsy when the tryptase level is twice normal (21.8 ng/mL). They round the number down to 20 ng/mL because all tests have a margin of error. By rounding down to 20 ng/mL, they catch patients that might not have made the cutoff before because of an error in the test. This means that a patient who has a tryptase level of 20 ng/mL or higher is likely to have a bone marrow biopsy that will be positive for systemic mastocytosis. 56. Why do I react every time I eat? When you swallow food, your nervous system sends signals to tell the cells in the stomach that food is on the way. As a result of this neurologic signal, hormones are released to tell your stomach to get ready to digest. These hormones cause histamine to be released by cells in the stomach. The histamine tells your stomach to make acid to digest your food. Solid food is more activating to the stomach in this way than liquids are. This is a normal function of the body and happens in everyone, not just people with mast cell disease. However, histamine released in the stomach can activate mast cells and cause typical mast cell symptoms. Like everything else in mast cell disease, how much this affects patients varies a lot. But something to keep in mind is that a lot of mast cell patients who are “allergic to everything they eat” are actually reacting to the normal histamine release that contributes to digestion. They are essentially allergic not just to what they are eating, but to the process of eating. 57. Do I have to go to the hospital every time I use an epipen? Unless you have received very explicit instructions not to do so from a health care provider that is familiar with the particulars of your life and your health, you need to go to the hospital every time you use an epipen. The reason for this is because an epipen is a temporary measure. The purpose of the epipen is to give you time to get to a hospital for more advanced care. Epinephrine is broken down by your body in a matter of minutes so it only provides a small window of protection. While many patients only need one epipen, there is no way to know if you will have another wave of anaphylaxis after the first one. Additionally, many patients require other medications and IV fluids to treat anaphylaxis. These can be provided at a hospital. The reason you have to go to the hospital is to give you access to more comprehensive care, not because using an epipen is dangerous.